Miscellaneous Welcome to Women Active in Buddhism (WAiB), the Web's first comprehensive collection of links and resources on contemporary Buddhist women. Women teachers, activists, scholars, nuns, and yoginis (practitioners) may be found on these pages, as well as teachings and special events, projects, organisations, bibliographic and contact information for women in Buddhism. We also offer a complete guide to the many female meditational deities found in Tibetan Buddhist practice. This page was last updated on 16 September 2001. Since then, due to illnesses in the family and my obligations as caretaker, I have not had time to carry out the extensive revisions that are increasingly required. I hope to overhaul this site completely in late 2004. Warning: this will probably mean downsizing (a smaller but more handpicked site), so if you have any favourite links, do bookmark them soon. For details of changes and additions to this site, please bookmark and visit our What's New page. You are visitor number to this site since August 1996. Thank you for dropping by! Your comments and contributions are welcome. If you wish to recommend a teacher, an event listing or some other link for inclusion, please use our online form (but only if the item is directly related to women and Buddhism). Ven. Tenzin Palmo (Diane Perry) is the Buddhist nun who has become known around the world as the Englishwoman who spent twelve years in meditation retreat in a cave high in the Himalayas. Her story was made famous in the book Cave in the Snow: Tenzin Palmo's Quest for Enlightenment by author Vicki MacKenzie. Ven. Tenzin Palmo has just finished a speaking tour of Canada and is now continuing it in East Asia to help publicize and raise funds for her special project, the Dongyu Gatsal Ling Nunnery and International Retreat Centre for Women. North Americans had a chance to meet this remarkable Tibetan Buddhist nun in Toronto (Aug 7-20), Vancouver (Aug 21-26), Victoria (Aug 26-29), and Edmonton (Aug 29-Sep 4). For further details, please see her tour schedule at http://www.tenzinpalmo.com/ for contact information and further details of her engagements in each city, as well as her tour of east Asia in September 2001. 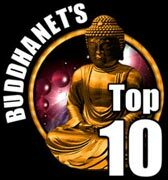 We made BuddhaNet's list of Top Ten Buddhist websites (2000)! BuddhaNet is an Australia-based "electronic meeting place of shared concern and interests [of] people committed to the Buddha's teachings and lifestyle." The Open Directory Project (formerly Netscape Open Directory) chose Women Active in Buddhism as an Open Directory Cool Site (1999). Women Active in Buddhism also received the Mystic Site of the Web Award of Excellence in the category of Eastern Philosophy (1999). We were honoured to be named a Three Jewels site for Excellence as a Buddhism Resource by the late eDharma Magazine (1999). This page last amended 16 September 2001 by web custodian Julia Milton. artist and former webmaster of Osel Shen Phen Ling. Thank you!